I was aware that the club had a blind golfer, but didn’t really know much more about Andy or his achievements. I was reminded of the fact when one of my golfing partners recently related this story. After a particularly bad round, he was consoling himself in the 19th and when someone asked “How did you play today?”, he responded “30 points, a blind person could have done better” . Another voice replied “I did!” Whilst my mate didn’t know him, or that he was blind, Andy was sat in the same room. As well as being successful in his business and golfing life, Andy also sports a quick wit! Within the club, Andy is a bit of unsung hero, yet someone we should be very proud of, so I asked him if I could put a short question and answer session on the web site so that we could learn a little more about Andy and his achievements. How long have you had your eyesight problems? It started when I was 17, I have a rare genetic condition (Stargadts Macular Dystrophy), and it deteriorated very quickly. A quick look at your record shows that you have not let your disability hold you back, can you describe to what extent you can or can’t discern features on the course? E.g. the ball, flag etc? I find it hard enough to hit decent shots with normal eyesight, so how do you go about playing a round? What method do you use. In Blind golf events Martyn stands behind me and I hold the club in front of me and he shows me the left, middle and right of the fairway along with distances and any hazard information I then hit it. On the greens I pace to the flag for distance and get a feel for the contours. Martyn will then tell me to open or close the putter face and I hit it. Obviously I hit all the great shots and Martyn the Bad ones!!!! Only kidding!! Is golf handicapping based on the standard system, and what is yours? My Club Handicap is 20 but I intend to improve this once more. My Blind Handicap is 15 which is calculated by taking a rolling two years of my Blind competition scores, choosing the best 50% of rounds and then averaging. EG if I have played 20 rounds then my best 10 cards are chosen. All competitions are off Yellow Tees. Blind golf has 3 categories. B1 no vision maximum handicap 56. B2 (me) up to 5% vision with maximum handicap 45. B3 up to about 10% vision maximum handicap 36. At the risk of showing me up, what’s your best score around Normanton? What do you see as your greatest golfing achievement so far? To become so accomplished must require a lot of hard work on your part, how often do you play? 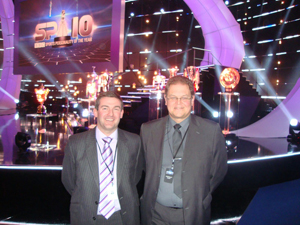 I do not want to look big headed but my only practice is playing Normanton every other week and my Blind golf events. What clubs do you use, and what is your favourite club? Driver Nike SQ back in the bag after I fell out with my Ping K15. Ping G15 3 wood, Rescue clubs back to Nike CPR 18 and 22 degree. Irons all Ping G15 and traditional Ping Putter. All supplied by Gary. Favourite club at the moment my rescue clubs but like all golfers that changes often!! Have you met any of the stars of golf? Who are your favourites? Gmac Andy and Westy. 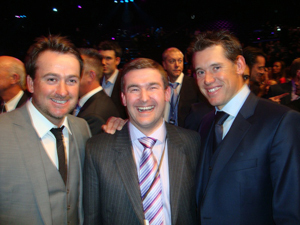 Well I met Gmac and Lee Westwood at the 2010 Sports personality of the Year show.’ Lee said "I hear you want to take me on?" , "That would be great" I replied. "How many shots will you give me?" asked Lee. Thinking quickly I replied "You can have 4 but we Tee off at midnight!!!!" Lee has a link on his web site to my web site (http://andysellars.webs.com/ ). As for favourite golfers, they are Lee Westwood, Luke Donald and Tiger Woods. So, have you played with any of the big names? My wife guided for me one year and I was hitting Driver and halfway on my down swing when she cried “STOP” which you all know at that point is impossible. I smashed the ball and ground and tee before turning to ask what Amanda had done that for, not feeling very happy, when I was met with. Your ball just fell off its tee. Luckily I had drop kicked the ball 100 yards. Thank goodness for 460cc Driver heads!! Your recognitions includes winner of the Wakefield and District 2011 Disabled Performance of the Year but I also read in the Express that you have been chosen to carry the Olympic Torch. That’s fantastic, how did you feel when you found out and where and when will it happen? What about Andy the person and life away from the golf course? I have a great family with my wife Amanda, Daughter Grace aged 5 (mad keen to have more golf lessons with Gary) and my son Isaac is 3 and cannot wait to be old enough to play Golf. I am a Business Support Director for Barclays whom I have worked for since leaving school in 1989 with great support of technology to undertake my role as well as support from great colleagues. I have a Golf Day at Normanton 13th June for 87 local business professionals taking me on to raise money for Blind Golf (see here for results and photos) . 23rd/24th June is the English Blind Strokeplay then off to Halifax Nova Scotia with Martyn on the 10th July for the Blind Canadian Open and World Championships (check out http://www.nsga.ns.ca/ for results during the match). My last event of the year is then the Disabled British Open on the August Bank Holiday weekend at East Sussex National against all disabilities. Thanks for your time Andy, good luck with the upcoming competitions, and when I hit a fat shot and blame everything but myself, I might think twice in the future! Pat McCann, The 'Webby Thing' man.